Discussion in 'Mineplex Guides' started by Wanderer, Mar 19, 2017. This thread goes over everything you need to know to correctly and efficiently submit Reports on our forums, that will have the highest chance of being accepted. Feel free to skip to a specific section if you need help with a specific issue or question! The offender's name must be completely visible in the evidence or we will have to deny the report, also, make sure that you have spelt the offender's username correctly. Including the name in the actual report is a requirement. Including it in the video-description or saying "Name is in screenshot" will not do the job. The offences include all of these. If reporting a player for a Severity 1 offence, the rule breaking in the report must be excessive. Evidence must show the chat, inventory and the scoreboard. The Evidence cannot be recorded in F1 or first person spectator mode entirely (if you go out of F1/Spectator mode during the video, it's fine). If Chatsnap is broken/glitched, you can resort to using Screenshots instead. Members of the Reports Patrol team reserve the right to deny your report if it does not meet any of the requirements above. However, if absolutely necessary exceptions can be made, at the discretion of Reports Team Members, Mentors and Reports Team Manager (Wanderer). Also, please note that reports submitted by newer users may need to go through additional reviewing before receiving a response. This may cause the response on that report to be delayed. Please be patient and we guarantee we will get back to your report ASAP, and it will be handled appropriately. Contact Wanderer, a Reports Patrol member or a Reports Patrol Assistance Member if you have further questions. Titan+ ranked players may want to refer to The Chatsnap introduction thread instead for this section, which makes reporting chat offences much easier and the response times to their reports much faster for them! Otherwise, when gathering evidence for chat offences, the first thing you should do when you see an offender is press F2. This will take a screenshot of that moment within Minecraft. You can then find this screenshot in your .Minecraft folder, which can be found in different ways on different computers. To get to the .minecraft folder, select "Run" in your start menu, which can be found by clicking the windows logo on Windows 7 & Right clicking the windows logo on Windows 8. Type %appdata%\.minecraft\, then click Run. It'll open your minecraft folder. For a Mac you will need to go to Finder which you can find in Launchpad then click Shift+Cmd+G Then type ~/Library/Application Support/minecraft then click "go". After locating your .Minecraft folder, find your "screenshots" folder, and scroll down, and you will see your most recent screenshots with a timestamp as the title. Find your evidence and right click it and CTRL + C to copy it. Once you have said evidence you will need to upload it to an Image Hosting service. Once you have a link to your evidence, you can place it in the appropriate order in your report. If you are a Titan+ ranked player, please make use of /chatsnap when reporting Chat Offences! Check out this thread explaining how to use it for reference. When gathering evidence for Gameplay Offences you can choose to either provide screenshot or video evidence, although important to note is that video evidence is heavily preferred within the Reports Team and will overall always give you a higher chance of having your report accepted. If you however believe a screenshot will be sufficient for your report, you may use that in your report. In some cases this is definitely the case, such as Map Exploit where you are able to tell the player's IGN from the screenshot. How to make a screenshot is explained above, under "Chat Offences". Please check that out if you want to know how to create a screenshot. Please note that the only Gameplay Offence that needs video evidence is Teaming and Cross-Teaming. If you wish to report a Gameplay offence with a video, read in to "Hacking Offences"
When reporting a Hacker, we always require video evidence, even if you think your screenshots are enough to get a player punished. We will not accept screenshot evidence. You can record players Hacking by using Free Recording Software. Once you have recorded your evidence you can upload it straight away. However we recommend you use video editing software to cut to the places where the Hacker (Or Gameplay offender) can be seen, to make your report easier and faster to get through for us. To do this you can use very simple, and very free software like Movie Maker which was made by Microsoft, usually built-in in Windows systems and is completely safe to use. Once you have your evidence (Edited Or Not) it is highly recommended you use Youtube.com to upload your video, because you can embed it using the Forum Editor that way. Set your privacy to "Unlisted" Or "Public", but do NOT set it to Private. This means we cannot view it. 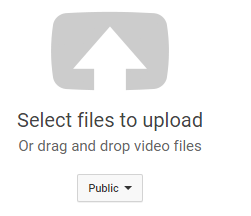 Select the video from your computer & let it upload. After completion, select "Publish" or "Done" and you will be provided with a link to your video. You are absolutely free to use other, non-youtube sites as well. Though we definitely recommend Youtube over anything else. Please try to not edit the speed of the video (making it faster or slower) as this is unnecessary. If needed we can speed it up or slow it down ourselves. Slowing videos down or speeding them up yourself makes the evidence harder for us to review. When you successfully submit a report, you will receive a message on the Reports page stating your Report has been submitted, and receive a message in your inbox from our Reports info bot stating your report has been submitted and will be reviewed shortly. 1) Go to http://www.mineplex.com/forums and scroll down to the bottom of the page. 2) Under "Application Hub", open the hub by clicking the "Eye" icon and click the first link that says "Reports". - Pending Reports will be listed under "Reports". - Processed Reports can be found back in "Reports Archive", and the Report will have either a red "Rejected" tag or a green "Accepted" tag depending on what the staff member decided on the report. You are able to view the exact response to the report, which players were punished, why the report was rejected and what happened to it, by clicking on the title like any normal thread. We hugely recommend you do so. When your report is processed by a staff member, you will receive an Alert stating what happened to what report, which you can click to be directed to the report itself to see the message the staff member provided for their decision on the report. If you disagree with their decision, please try private messaging the staff member yourself. If after talking to the staff member you still disagree with their decision and would like to have it re-evaluated, please contact Wanderer directly providing a link to your report. Phamtastic, Marzie, Shaiym and 19 others like this.